Interests:Metal music, competitive MOBA's, FPS Games (Call Of Duty and Battlefield Mostly), Gothic themed art, clothing, furniture, Gothic anything really lol, and Anime. Did you even read any of the threads below yours, before you posted? There is one right below yours. Yes, I did, the issue is though, unlike them mine worked with windows 10 before and is now suddenly not working. I figured there might be a way to fix it if that were the case, which it is. If it worked before and now suddenly doesn't then something has changed in your system. What updates,etc have you done to your system? If so, have you run it again since this started and have it do 'Repair'? I have the same issue. Since I see a number of folks saying they're using Windows 10 I tried a Dell Mobile Workstation at the office that still has Windows 7 on it and it still crashes upon trying to log into Twitch. I'm going to try Open Broadcaster Software on this machine as I had little luck getting it to recognize as a video capture card on my Windows 10 machine (no video would pass through to OBS, though it would show up in Capture mode in the Roxio software). I'll add that I have installed the 2.1 update. This is a new purchase I just received yesterday, so I don't have a "it worked previously" story, heh. Honestly I wish I knew for certain however, I did do a bit of folder scanning(in other words I looked through each individual folder for the installed program) and noticed that there were no files relating to twitch at all but there were files that were for youtube I thought that was odd, maybe I really am missing some critical files that is causing the crash? I can show you what I mean via screenshot if that'll be any help. Because otherwise I am lost on what to do I already tried to do a factory reset on my Laptop but.. I discovered that the option to do so has, for some reason, been removed(or I am unable to locate it through the areas it should be located) even when I boot the Laptop via Advanced Startup. I have. Actually there is one thing that I just remembered that seems odd to me, besides the fact that it suddenly stopped working, I had my account logged in and I don't recall needing to log in more than once since I always use the "remember me" check box but the day this started to occur I was trying to sign in when I should have already been logged in by default, I never even noticed that until now I didn't think anything of it really. But does it work now? I find that explanation a little far fetched... Most Reg Cleaner always find something, usually many things, to make themselves look self important. And why would it not affect any and all program installations? Likewise the uninstall or repair should be enough to fix it. I am having the same issue as everyone here. It is strange though because everything worked perfectly fine for about a year on my laptop until recently. Now every time I go to log into twitch using Roxio, the second I hit that log in button, the application crashes. 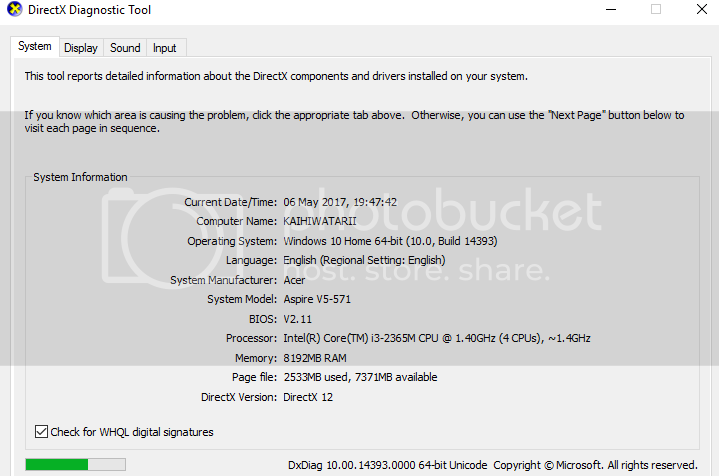 - Reformatted my computer to factory restore settings. - Reinstalled the Roxio software and fully updated. - I tried to mess around with the settings however nothing seemed to work. - Tried two different twitch accounts. - Laptop is up to date. - Using the software of a different laptop. Below are pictures of the crash and my dxdiag. When you reformatted to factory settings did this included any updates that were recorded into that? The restore from a partition that was on there when new would not normally allow any updates. Did you try it out before adding any updates to the Roxio software? It would be nice if you can try another PC to test the software on but these things can be madding! Hi there, sorry for the late reply but thank you for your reply. - I tried my flatmates Laptop however the same problem happens. - Windows is fully up to date. To summarise my problem, The recording kit still captures and records however the problem is with streaming. Anytime I click the login button to Twitch, the application crashes which I would assume is an issue with the software communicating with Twitch. All together I have given up, I will contact Roxio just to let them know of the issue in hopes they fix this bug however I believe I have done all troubleshooting to resolve. Its a shame though because this kit was perfect and was working perfectly and I loved it. I dunno if it is worth contacting Twitch in case the bug is on their side but I don't think anyone has found a resolution to this problem. OBS would be worth a try to see if it works through that. 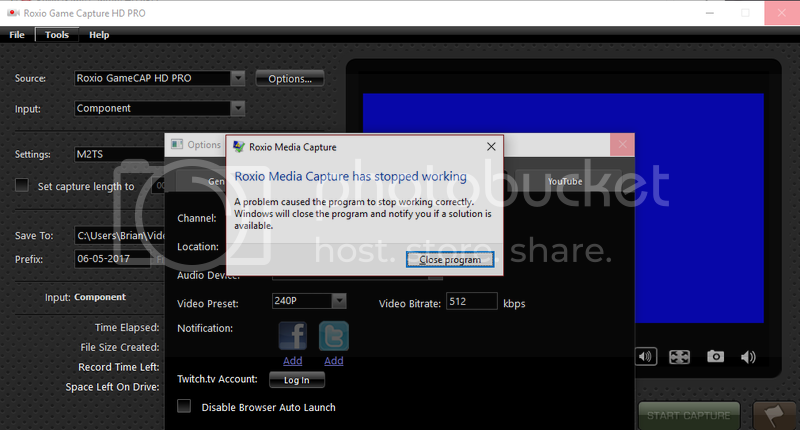 It is the only software I know of that works with Roxio's GameCap. Pixel, the short reply is, you are wrong. No. You've told me yourself to create a new thread when my issues were exactly the same as the op.